A national framework for religious education in schools has been set out for the first time. Pupils aged three to 19 in England will study Christianity at each stage, with other major faiths being looked at, but in less detail. Secular philosophies, such as humanism and atheism, could also be dealt with. The Qualifications and Curriculum Authority said its framework would promote "understanding and respect" and the ability to discuss ethical issues. Currently, RE syllabuses are decided by local authorities. 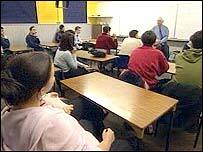 By law, all state schools must teach the subject, except to pupils withdrawn from classes by their parents. Last week, the chief inspector of England's schools, David Bell, suggested schools dropped their legal obligation to provide "a daily act of collective worship". He said 76% of secondary schools were breaking the law in not doing this. The requirement should now be weekly or even monthly, rather than daily, the head of Ofsted added. The QCA framework for RE, which is recommended rather than statutory, says: "A central concern of religious education is the promotion of each pupil's self-worth, enabling them to reflect on their uniqueness as human beings, to share their feelings and emotions with others and appreciate the importance of forming and maintaining positive relationships." As well as Christianity, the tenets of Buddhism, Hinduism, Islam, Judaism and Sikhism should be studied, it adds. Other religious traditions, such as the Baha'i faith, Jainism, Zoroastrianism, should "also feature particularly in addressing local needs and circumstances". The framework calls for pupils' "own world-views", including secular philosophies, to be studied. It envisages pupils "appreciating the sense of wonder at the world in which they live, and their response to questions of meaning and purpose", while "recognising that knowledge is bounded by mystery". Looking at the diversity of cultures and religions within the UK would improve the citizenship skills of young people, the QCA said. Education secretary Charles Clarke met religious leaders last year, before the framework was decided. The QCA's chief executive, Ken Boston, said: "QCA is committed to providing national support to ensure that local provision is of the highest quality. "This consultation will provide opportunities for LEAs [local education authorities], faith communities, teacher trainers and teachers to comment on, and shape, the draft framework for religious education, and make clear to us what further support they need to provide effective teaching and learning in RE. "I am grateful to the different groups who have worked hard helping to draft the framework."